Over the recent years, dental implants have become the most exciting and advanced dental technology. Dental implants in Melbourne have gained this popularity because of its extreme durability and long-lasting characteristics. These implants have a very high success rate of 98% when maintained properly. When such implant failures occur, the dental implants placed must be removed to avoid further complications. Here, we have listed the 6 common practices every dental professional do to prevent dental implant from failing. If a dental professional suggests implant to person who lacks any of these key factors, it might increase the chances of implant failure. Also, many dental professionals avoid giving dental implants to young patients below 20 years of age. This is because, their jaw and facial bones have likely not finished forming until they are in their 20s. They also recommend their patients to quit smoking to increase the success rate of dental implants in Melbourne. Studies show the implant loss rate for smokers is around 15.8 precent while the rate for non-smokers is around 1.4 precent. Moreover, clearing up any gum disease or infection is essential to avoid or prevent any risk factors for implant failure. Many experienced dentist in Melbourne stay on top of dental problems as soon as they arise. They try to concentrate on compromised tooth with fillings, crowns and root canals before we subject you to an involved and expensive dental implant. To stabilise your dental implant, one should need enough solid jaw bone tissues. Dental professionals add bone mass to your jaw bone through grafting, if your bone tissue is not deep enough, wide enough or long enough. However, this can add more time and cost to your treatment but ensures high success rate. Melbourne Dental Implants specialists doesn’t rush the osseo integration process because it needs some time the post and your jaw bone to fuse together to become one. This step of process is absolutely crucial for implant success. When an implant is placed very close to a nerve, it leads to pain and tingling that makes removal of implant necessary. 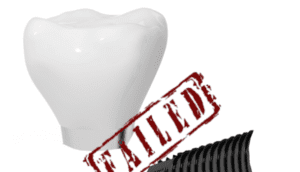 The major cause for implant failure is said to be peri-implantitis, the destructive inflammatory process affecting the soft and hard tissues surrounding dental implants. It occurs when pathogenic microbes in the mouth and oral cavity develop into biofilms, which protects them and encourages growth. Peri-implantitis is caused when the biofilms develop on dental implants.